RVUNL Admit Card 2018: Below are the admit cards published by RVUNL - RVUNL - Rajasthan Rajya Vidyut Utpadan Nigam Ltd. / 111.118.190.142. The recent Admit Card issued for the recruitment drive is Stenographer Admit Card 2018. RVUNL Stenographer Admit Card 2018: RVUNL - Rajasthan Rajya Vidyut Utpadan Nigam Ltd. has issued the Admit Card on 31 Dec 2018 for RVUNL Stenographer Exam 2018 which is scheduled to be held on 04 Jan 2019. RVUNL Technical Helper II Admit Card 2018: RVUNL - Rajasthan Rajya Vidyut Utpadan Nigam Ltd. has issued the Admit Card on 18 Dec 2018 for Technical Helper II Exam 2018. 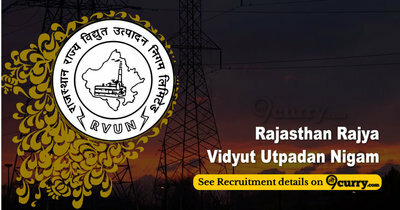 RVUNL Jr. Assistant/ Commercial Assistant-II Admit Card 2018: RVUNL - Rajasthan Rajya Vidyut Utpadan Nigam Ltd. has issued the Admit Card on 13 Dec 2018 for Jr. Assistant/ Commercial Assistant-II Exam 2018. RVUNL Informatics Assistant DV Admit Card 2018: RVUNL - Rajasthan Rajya Vidyut Utpadan Nigam Ltd. has issued the Admit Card on 03 Oct 2018 for Informatics Assistant DV Exam 2018. RVUNL Informatics Assistant Phase II Admit Card 2018: RVUNL - Rajasthan Rajya Vidyut Utpadan Nigam Ltd. has issued the Admit Card on 17 Sep 2018 for the exam which is scheduled to be held on 23 Sep 2018. RVUNL Junior Assistant/ Commercial Assistant-II Phase II Admit Card 2018: RVUNL - Rajasthan Rajya Vidyut Utpadan Nigam Ltd. has issued the Admit Card on 17 Sep 2018 for the exam which is scheduled to be held on 23 Sep 2018 to 24 Sep 2018. RVUNL Junior Engineer DV Admit Card 2018: RVUNL - Rajasthan Rajya Vidyut Utpadan Nigam Ltd. has issued the Admit Card on 25 Aug 2018 for Junior Engineer DV Exam 2018. RVUNL Junior Chemist Admit Card for DV 2018: RVUNL - Rajasthan Rajya Vidyut Utpadan Nigam Ltd. has issued the Admit Card on 16 Aug 2018 for Junior Chemist Exam 2018. RVUNL Assistant Engineer Admit Card for DV 2018: RVUNL - Rajasthan Rajya Vidyut Utpadan Nigam Ltd. has issued the Admit Card on 16 Aug 2018 for Assistant Engineer Exam 2018. RVUNL Technical Helper Admit Card 2018: RVUNL - Rajasthan Rajya Vidyut Utpadan Nigam Ltd. has issued the Admit Card on 13 Aug 2018 for the exam. RVUNL Various Post DV Admit Card 2018: RVUNL - Rajasthan Rajya Vidyut Utpadan Nigam Ltd. has issued the Admit Card on 09 Aug 2018 for the exam. RVUNL JEN, Jr Chemist, IA Admit Card 2018: RVUNL - Rajasthan Rajya Vidyut Utpadan Nigam Ltd. has issued the Admit Card on 12 Jul 2018 for JEN, Jr Chemist, IA Exam 2018 which is scheduled to be held on 29 Jul 2018. RVUNL Assistant Personnel Officer, Junior Legal Officer, Junior Accountant & Other Posts Admit Card 2018: RVUNL - Rajasthan Rajya Vidyut Utpadan Nigam Ltd. has issued the Admit Card on 22 Jun 2018 for Assistant Personnel Officer, Junior Legal Officer, Junior Accountant Exam 2018. RVUNL has issued the Admit Card on 15 Jul 2017 for the exam which is scheduled to be held on 01 Aug 2017 to 02 Aug 2017. JVVNL has issued the Admit Card on 15 Jul 2017 for Download Junior Engineer JEN Call Letter for Documents Verfication which is scheduled to be held on 01 Aug 2017 to 02 Aug 2017.